Charging the Earth - Solar! : Voltage Optimisation... will it work? the voltage reduced - 218-220v AC now. 5 Nov '10: I had a V-Phase voltage optimiser fitted today by a local company MCI. The idea is to reduce our power consumption, especially for motorised appliances (such as pumps). The voltage in our street is 248 voltsAC, and assuming that the resistance of the appliance is unchanged, that has to use more power than a similar one that runs to a voltage of 220 or 230vAC. The British Grid seems to run well, but mostly in the range of 240-255volts. Most appliances since 1990 have to be designed to run at 220volts. The only one that benefits from the much higher voltage is the Oven, because that would just take longer to reach working temperatures etc, so we didn't include that in the regulation. The kettle will be a bit slower.. but I can live with that. There seems no point in having bought A-rated appliances and then running them at 248 volts - so I am willing to do it now, and not hesitate a few years wondering whether to bother. More volts = more power consumption over the length of a day, a week, a month. So the reduction of 30 volts on everything including the heat pump but excluding the oven could be a ten per cent saving over a year - I am hoping for a few hundred kilowatt hours over the year! I will carry on metering, and report back! One thing it cannot, but doesn't need to do is interfere with the PV panel system. This installation is about limiting consumption. We rely on the Sonny Boy inverter to do its job of synchronization to the Grid correctly. In case any US readers are googling this, then it is also spelt Voltage Optimization. The higher the voltage the higher the energy consumption. As a rule of thumb, reducing the voltage by 5% will result in savings of 10%. In addition, higher voltage tends to increase the heat generation in motors, and generally reduces the life expectancy of electrical equipment, including lighting bulbs. Voltage optimisation works best on inductive loads - motors and lighting for example - and significant savings can be achieved on motors in particular, especially if these are not loaded at 100% of the their capacity for 100% of the time. i have gone through from your post, it is nice and your idea is very creative. 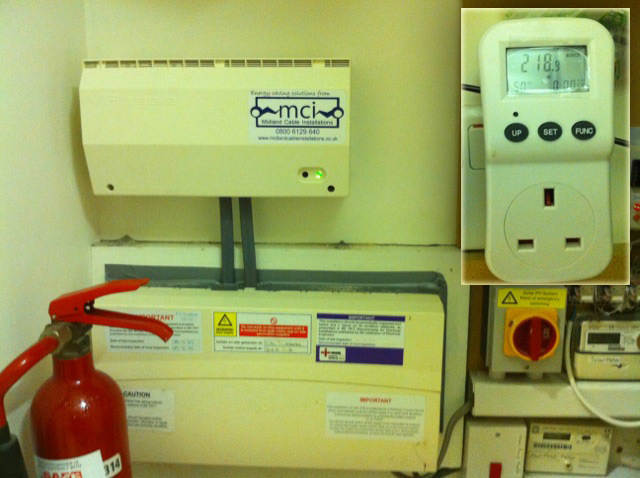 You have defined good use of Voltage Optimisation, it reduce our power consumption, especially for motorised appliances .